Being a writer is like being a lion tamer. Minus the chance you could get mauled to death. If you are a writer you know exactly what I am talking about. Writing is the wild act of wrestling ideas to the ground and then, somehow, fashioning those ideas so they make some kind of logical sense to another human, all the while, using hundreds of little black lines and squiggles on a white backdrop. My coworker and I have started exchanging writing samples for critique and it is the worst best thing I have ever done. Yes, I said worst best. It is the best because she is diligent with her notes, does not pull her punches and still encourages me to keep showing up. It is the worst because I am suffering from a bad case of writer’s block. I’ve never had such serious writer’s block in my life. It feels just like standing next to a giant rock on the coast at high tide and knowing that if you wait long enough the water will recede and there is a cave under there with a treasure trove just waiting to be explored. I know it is there. That damp cave is definitely there, but the water is just not pulling back out to sea like it is supposed to, damn it. My stories are trapped in that slimy cavern. They are rich with bright colors and offending smells and undiscovered creatures. And all of it is hiding behind my wall of stress and self-protection and over-commitment to other projects. It isn’t a lack of content. I have a whole ocean of words to say, but where do I start? I have so little time that I want to have preplanned which story will come out and how long it will take and how much caffeine I will need to pound it out at 2am on a Thursday morning. But every writer knows it doesn’t work like that. Writing is both a measured discipline and a wild animal. Our stories do not follow our rules. At least mine never have. Writing is both a measured discipline and a wild animal. 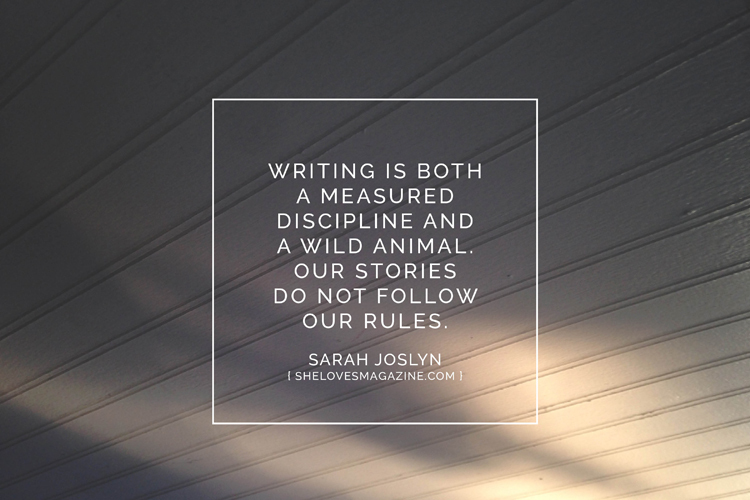 Our stories do not follow our rules. That is how I found myself in the middle of a street on a sun-dappled spring day fanaticizing about writing. I was hustling back to my car after dropping off two five-year-olds at their kindergarten class and I felt my mind describing the feeling of sweat when it trickles between misaligned shoulder blades, over tattoo ink and peach fuzz and down to the small indent right over my sacrum where it will slowly and disgustingly leach into the band of my no-nonsense underpants. I wasn’t even writing. I was thinking. I was thinking in the way that makes me sure I am a writer, but I just can’t seem to stop and sit still long enough to be WRITING. That, my friends, might be the definition of ridiculous—it is me on a sidewalk with a child’s water bottle describing the travel of sweat down my back and considering myself a writer. I want to write the frivolous, unnecessary details of sweat meeting the band of my underpants, but I also want to write about the intense feeling of betrayal and disdain a 17-year-old feels when her father tells her she is definitely going to hell. It’s so shocking, even now, more than 10 years later, that just dumping it out there is too much. How can I have my feet in both camps? How can I feel so connected to the useless and beautiful details of my mostly happy-go-lucky life and then also want to write the tragic truth of my often-warped childhood? I feel overwhelmed by the idea that I have lived through so much and continue to show up and be chipper most days. Self-preservation is such a strange beast. I feel doubly overwhelmed by my desire to expose so much of my life to the world. I want to be heard and understood so badly. But then, also, anonymity whispers to me. Life is more than being heard. I cannot reconcile the halves of myself. I will always be betraying one part of me. This is the tension that makes me a writer.